This is a one-of-a-kind art piece. 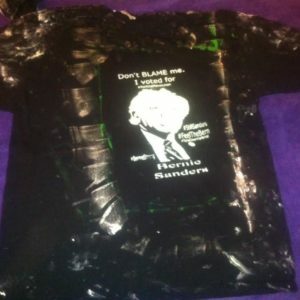 This is a shirt named, “Pinquo Chaos” designed to celebrate the policy offered by Bernie Sanders. The title sarcastically mocks the perception of the campaign as being anarchist or communist. 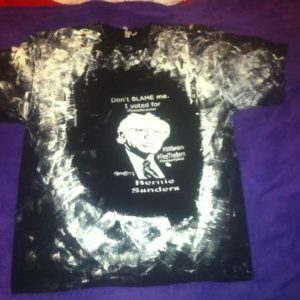 This is a shirt named, “The Perfect Pinquo Chaos” designed to celebrate the policy offered by Bernie Sanders. The title sarcastically mocks the perception of the campaign as being anarchist or communist. 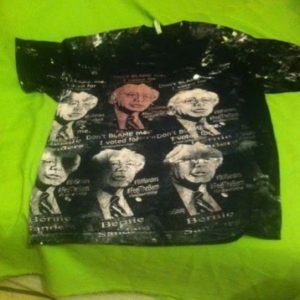 It also mocks the hashtag #ThePerfect and while the shirt isn’t actually entirely perfect, it is the perfect fashion art for the perfect Bernie Sanders supporter. The paint used to create the art piece is very thick and should last a decade even if worn regularly. We highly recommend that you put it in a frame and hang it on a wall. Wear it to a rally or two but I would try to pass this on to someone. It could be worth a whole lot someday. It is a one-of-a-kind item in the 2nd series by this artist. 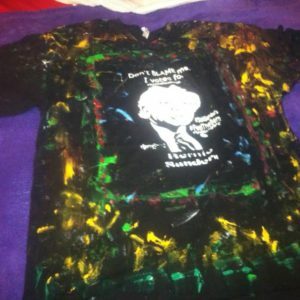 This is a black shirt with pink ,white and other colors of paint.